IN the "advertisement" to the original edition, the editor says: "The reader will soon discover that this is a work requiring no introduction to his attention. Indeed, whoever catches a glimpse of the attractions of the interior, will not be disposed patiently to listen to any details intended to detain him on the threshold." While this is so, it may not be out of place in this new edition to give the reader a brief sketch of the history of the family to which the author of this extraordinary biography belonged. It will at least enlighten him, at the outset, with regard to many allusions to family associations and connections continually cropping up in the narrative; while it will explain the author's predilection for "the company of his superiors," which some of the parishioners of Inveresk raised against him as unbecoming in their minister. Dr. Carlyle did not require, like the governess at Balcarres, who, anxious to parade a "lang pedigree" before her "superiors," instructed her brother in the Herald Office at Edinburgh to prepare a family tree beginning with Fergus the First of Scotland, and indicating the several families she wished introduced. His was without doubt a family of great antiquity reaching back to, if not before, the Norman Conquest, and one which was closely allied by marriage to King Robert the Bruce. [A full account of the Carlyle family will be found in Sir J. Balfour Paul's Scots Peerage.] The Carlyles—de Karliolo, Carleile, or Carlisle, as the name was variously spelt —were a Cumberland family originally, who held property there and in Yorkshire, and were of considerable authority in the county, and the city of Carlisle from which the name was derived. In common with other notable families on the southern border, the Carlyles early began to add small properties in Scotland to their English lands, and thus acquired a dual interest in the border country. From their position in the north they were employed by the English monarchs on service to the Scottish Court, but such service did not prevent them occasionally deserting their royal masters in a raid on Scotland, for on one occasion, at least, we learn that a Robert de Carlisle had to appear before Henry II., and pay peace money for having joined King William of Scotland, promising at the same time allegiance to Henry for the future. While still holding allegiance to the English throne, the family associated themselves with the cause of the Bruces, Lords of Annandale, and through their influence gradually increased the extent of their property in that district, which till then was confined to the parish of Cummertrees, where centuries later Dr. Carlyle's father was minister before he was translated to Prestonpans. But it was in the days of King Robert the Bruce that Sir William de Carlisle, having married the King's sister, Margaret, finally threw off the English allegiance, joined the Scots, and thereby forfeited his English estates. For this and other services rendered to Bruce further lands in Annandale were granted to Sir William and his lady, and the family rose to great importance in the country. Following this valiant knight were several generations who took no great part in public affairs, but through mortgages, as in the case of the Limekilns property, or otherwise, apparently added considerably to the family estates until nearly one-half of Annandale was tinder their control. Towards the end of the fifteenth century the family again comes into prominence in Scottish history in the person of Sir John de Carlisle, who was Keeper of Threave and Lochmaben Castles; was sent on a mission to France by James the Third; and for the active part he played in suppressing the Douglas rebellion, was raised to the peerage as Lord Carlyle of Torthorwald. Of his three successors in the peerage little is recorded. On the death of the fourth Lord Carlyle the greater part of the estates passed into the possession of his granddaughter, but only after long litigation which greatly depleted them. This lady married a Douglas of Parkhead, and her Carlyle properties were ultimately merged in those of Douglas of Drumlanrig, first Earl of Queensberry. With the loss of their property the family did not relinquish their right to the title, although they discontinued the use of it, until towards the end of the eighteenth century the direct male line of the Barons Carlyle of Torthorwald became extinct. A great-grandson of the Sir William de Carlisle of Bruce's day, nephew of the first Lord Carlyle, obtained from his uncle a charter of the lands of Bridekirk, and became the ancestor of that branch of the family which terminated with Dr. Alexander Carlyle's death. The Bridekirk family do not emerge in Scottish public affairs; but in the reign of Charles i., one member of it, Ludovick, held a position at Whitehall as Groom of the Privy Chamber, and later Keeper of Richmond Park, while he also made some reputation as a playwright. On his retirement from office in England, he purchased the estate of Newpark, near Annan, and close to the Bridekirk property. His son Ludovick, born in 1647, was the father of Mr. William Carlyle, minister of Cummertrees and later of Prestonpans, and the grandfather of the author of this Autobiography. In the course of his narrative Dr. Carlyle makes frequent reference to his relationship to the Jardines of Annandale—his father and mother being both related to branches of that family—and earlier in their history we find the family became connected by marriage with the Johnstones, who were represented in Dr. Carlyle's day, and were his great friends, by Sir James Johnstone of Westerhall and Sir William, who, on his marriage, assumed the name of Pulteney. Recognising, therefore, the position his family for centuries had occupied in the south of Scotland, and their close association with the powerful border clans of Douglas, Jardine, and Johnstone, we can realise his appreciation of the "company of his superiors" in which by "right of lineage, by culture and talent, by dignity of manner and vivacity in conversation," Dr. Carlyle naturally took his place, and fulfilled his part in a manner rare among the clergy of the first half of the eighteenth century. In the Supplementary Chapter by John Hill Burton will be found an explanation of the nature and conditions of the materials placed in his hands for the original publication, and the manner in which he thought fit to execute the trust confided in him. Every reader of the Autobiography will regret, with Dr. Hill Burton, that the gifted author did not live to complete his story; while at the same time, also, it will be admitted that what he has left is a unique picture among the many that have come down to us of the life and manners of the period in which he lived. The Publisher would here wish to express his indebtedness to Colonel Bell for placing the original MS. of the Autobiography at his service, by which he was enabled to correct one or two minor slips in the original issue; for the use of the first draft of the Autobiography—the "Recollections"—from which further interesting notes have been added to this edition; and, finally, for his kind permission to reproduce for the first time the miniature portrait of Dr. Carlyle which forms the frontispiece to the volume. Sketches of society — Lord Milton — Lady Hervey —Smollett's visit—Cu lien's mimicries—Notices and anecdotes of David Hume, Adam Smith, Adam Ferguson, Dr. Robertson, Dr. Blair, John Home—Foundation of the Select Society—Completion of the tragedy of Douglas —Adventures of its author and his friends in conveying it to London—Admiral Byng—The Carriers' Inn. Preparations for acting the tragedy of Douglas in Edinburgh—Carlyle attends—A war of pamphlets—The "Libel" against Carlyle—The ecclesiastical conflict—Characteristics of the combatants—The clergy of Scotland and the stage—Conduct of Dundas and Wedderburn—Home and his success—Archibald Duke of Argyle. Finds Robertson in London about his history — Home joins them—Their friends and adventures—Chatham—John Blair the mathematician — Bishop Douglas —Smollett and his levee of authors—A clay with Garrick at his villa—Feats at golf there—The clergy of Scotland and the Window-tax—Adam the architect—An expedition to Portsmouth—Adventures by land and sea—Meeting with Lord Bute—The journey home—Oxford—Woodstock—Blenheim—Birmingham—Lord Lyttleton —Shenstone at the Leasowes. Visit to Inverary—Charles Townshend and the hospitalities of Dalkeith—A story of a haunch of venison—Wilkie of the Epigoniad — A corporation row in Dumfries—Andrew Crosbie—Ossian Macpherson —The militia pamphlet. His marriage—Adam Ferguson and Sister Peg—Death of George ii. and the Duke of Argyle—Change in the administration of Scotch affairs—Newcastle and its society in 1760—The Edinburgh Poker Club—Lord Elibank's sentimental adventures—Dr. Robertson and the leadership of the Church of Scotland—Harrogate and the company there—Andrew Millar the bookseller—Benjamin Franklin—Lord Clive. 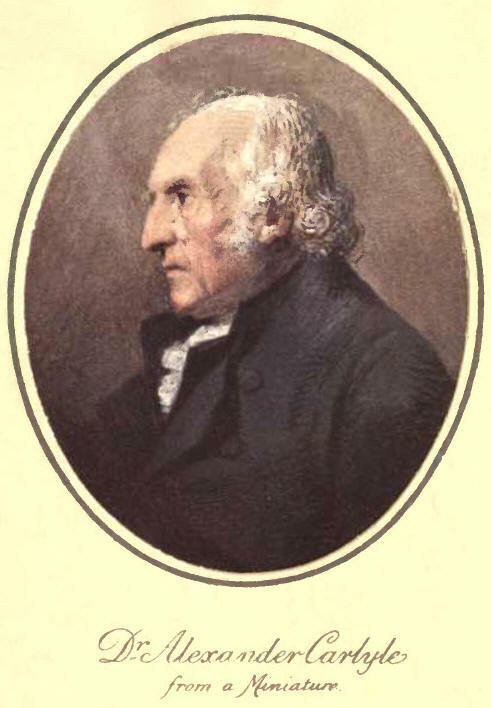 Domestic affairs—Henry Dundas—Harrogate revisited—Adventures with a remarkable bore—The author of Crazy Tales — Ambassador Keith — Education of the Scots gentry—John Gregory—Mrs. Montague and her coterie—Death of the author's father—Sudden death of his friend Jardine—Church politics. Visit to Lord Glasgow with Robertson—Convivialities—Synod business—Dr. Armstrong—An excursion to Tweed-dale and across the border—Adventures in Carlisle—The Duke of I3uccleuch and festivities at Dalkeith—Adam Smith there—Professor Millar of Glasgow. The clergy of Scotland and the Window-tax--Carlyle appointed their champion—Sojourn in London—The Scotch dancing assembly—Dr. Dodd preaching to the Magdalenes---The career of Colonel Dow—Anecdotes of Wolfe and Quebec—Garrick and John Home's plays —Decision of the Douglas Cause—Lord Mansfield—Conversation at Mrs. Montague's — The return home —Back to London about the Window-tax—Anecdotes of the formation of the North Ministry—Conclusion. His correspondence on Church matters—His influence—His lighter correspondence—The great contest of the clerkship—The augmentation question—Politics—Collins's Ode on the superstition of the Highlands—Carlyle and poetry—Domestic history—His personal appearance—The composition of his autobiography—Condition and editing of the manuscripts—His last days—His death. Account of its Foundation: Together with unpublished letters of Thomas Carlyle to W. D. Christie, C.B.